It has been a terrible week for all involved at Tottenham but they have a good platform to put their bad form aside on Wednesday against Watford. Tottenham Hotspur welcome Watford to Wembley Stadium on Wednesday just days after being eliminated from both the Carabao Cup and FA Cup. Mauricio Pochettino's side have endured a torrid week as his depleted squad suffered back-to-back defeats in the space of just four days. However, Wednesday's game offers the Lilywhites the perfect opportunity to get themselves back on track in front of their own fans. This time last week Tottenham were still in all competitions, going into their Carabao Cup semi-final second leg with a slender advantage and with a FA Cup fourth-round clash against Crystal Palace days later. Now, Spurs find themselves dumped out of both competitions and the prospect of lifting a trophy this season has suddenly become highly unlikely. As for Wednesday's visitors to Wembley, Watford have had a successful week. They were held to a draw against Burnley in their last league game but the point was enough to keep the Hornets in seventh place in the Premier League. In the FA Cup, Javi Gracia's side made the long journey up north where they disposed of Newcastle United in a comfortable 2-0 victory to secure a spot in the fifth-round of the FA Cup. Spurs have been handed a huge slice of luck going into the game a Heung-min Son is in contention to feature. The South Korean has returned to London a lot earlier than expected after his country was eliminated from the Asia Cup by Qatar on Friday. Harry Kane and Dele Alli still remain out with their long-term injuries. Ben Davies is also out of the clash after suffering a groin injury in the defeat to Chelsea but Moussa Sissoko has returned to training. Javi Gracia has no fresh injury concerns. Watford have a dreadful record away to Spurs having never won in north London in the Premier League era. However, in the past meeting between the sides in September it was the Hornets who prevailed. 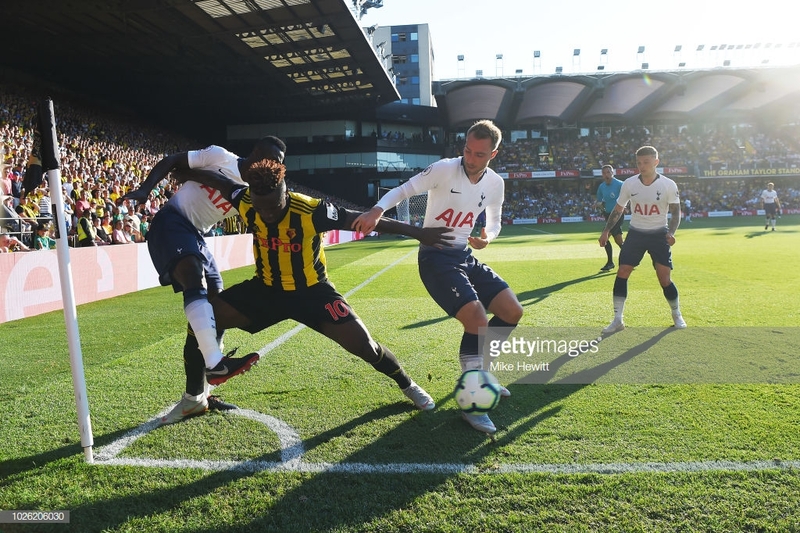 Spurs took the lead through an Abdoulaye Doucouré own-goal but quickly turned the scoreline on its head as two quick goals from Troy Deeney and Craig Cathcart secured a shock victory. The three points saw leapfrog Pochettino's side and move up to third place. The Lilywhites did seek their revenge just a few weeks later as the two sides met in the Carabao Cup but Erik Lamela's late goal was cancelled out by an Étienne Capoue equaliser in the dying seconds. The tie was decided on penalties in which saw Paulo Gazzaniga shine as Spurs progressed into the next round.